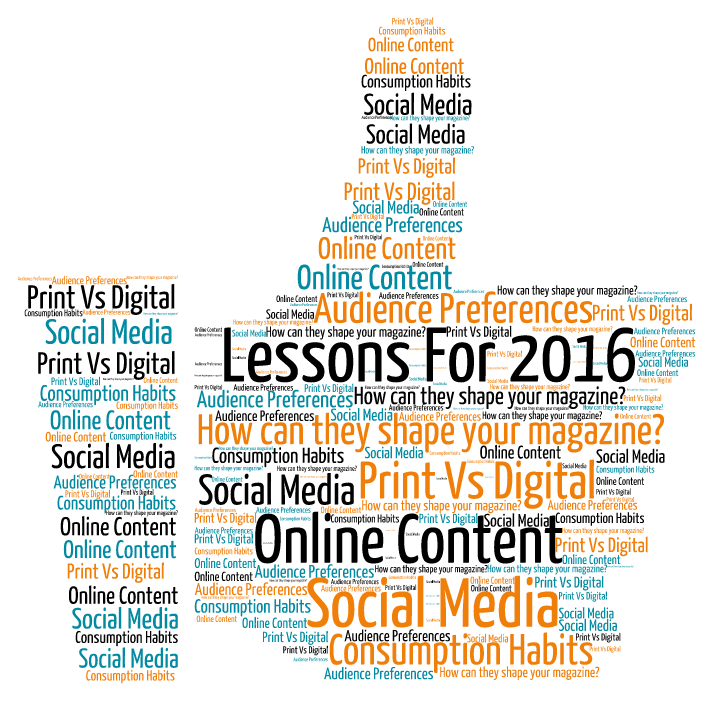 What can we learn from 2015 and how will those lessons shape 2016? Having read lots of articles/posts last month summing up 2015 I have identified the following four key trends that publishers should explore. Go local: Global is going local – and it’s a thriving market. Supermarkets realized a few years ago that people like to interact with their community, whether they are in London or a small village in the Peak District. As a result more are seeking out locally-sourced food and going to those small independent shops in their towns. But how does this relate to publishing? Well it’s about numbers and the fact that audiences are beginning to realize the value of a good, local magazine. So instead of developing more lifestyle or specialist titles (has anyone counted the number of cycling mags recently?) perhaps publishers should focus more on communities and explore how they can invest in local initiatives. I have recently been fortunate to work with a client who has successfully launched a local magazine. Not a basic free-sheet advertorial vehicle, but a carefully crafted publication with great content and solid advertising figures to support it. What makes it work is that the publisher focuses on the community by putting it first before profit – and that gives the magazine heart. So what can you do differently this year that will give your product a soul? Video is a must: All editors know the power of video and how it can enhance a news feed, post or digital edition. Should they be investing more in creating video content? Perhaps. But there are millions of videos online. So look at the next thing – which is live streaming. Twitter has recently launched Twitcam a brand extension that allows users to broadcast live from their webcam. Great concept, but why let Twitter get all the revenue? Editors it’s time to get more creative and add another dimension to your vlog. Bespoke publishing: Less is more with bespoke. For example, consider those highbrow magazines that are published less frequently costing the equivalent per issue of nearly three lifestyle titles. Readers are willing to pay for a good quality bespoke publication.I am talking Love, Wonderland and Nylon, but let us not forget the fabulous Monocule with great features on current affairs, business, culture and design. Of course you need to look at the bottom line, but don’t skimp on the look and feel. Great content must be matched with a quality exterior. Like Vogue – a bespoke title should be something your readers want to keep. Targeted distribution: Gone are the days where a magazine was locally distributed or launched on the newsstands. With the cost of distribution and getting titles stocked in retail outlets challenging many small publishers, there needs to be another option. And there is – targeted distribution. The key here is working out where your title needs to be then approach direct, cutting out the middleman. Some of the clients I have worked with are trialing this strategy and making it work. How can this be successful? You must ensure that your magazine enhances or validates the target outlet in some way. Plus there’s a lot to be said for a direct approach. Don’t forget about online – selling latest editions, back issues or subscriptions through your website and using social media to drive traffic. Remember evaluating trends that work is the key to achieving sustainable publishing. So at your next editorial meeting take time to think about these four trends and how strategies developed around them might just give your magazine that extra edge. This entry was posted in Editorial strategies, Publishing strategies and tagged Bespoke publishing, Go local, magazine trends, Targeted distribution, The value of video content. Bookmark the permalink.